Only members with owner privileges for an organization or admin privileges for a repository can delete an organization repository. If Allow members to delete or transfer repositories for this organization has been disabled, only organization owners can delete organization repositories. For more information, see "Repository permission levels for an organization." 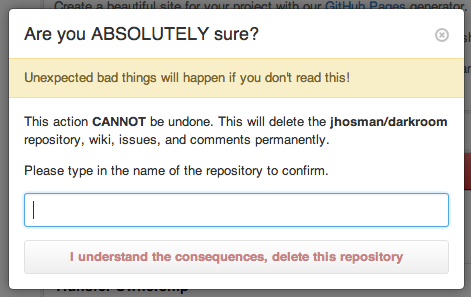 Warning: These steps will permanently delete the repository, wiki, issues, and comments. This action cannot be undone. Deleting a private repository will delete all of its forks. Deleting a public repository will not delete its forks. Deleting all of your private repositories will not downgrade your account to free. To verify that you're deleting the correct repository, type the name of the repository you want to delete.